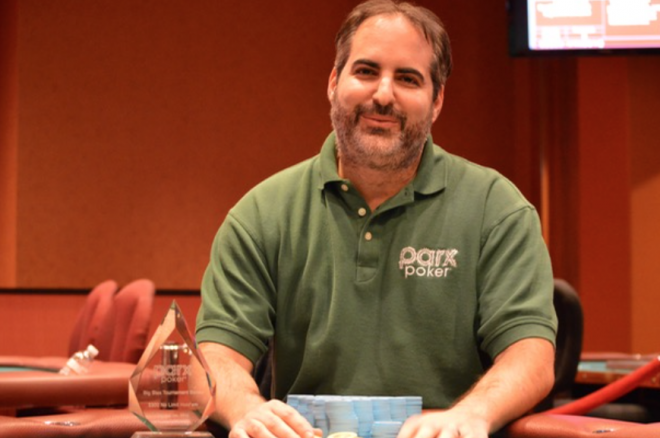 Matt Glantz wins Parx Casino Big Stax XIII 300 title, plus announces he will leave his role as room ambassador. The Parx Casino Big Stax XIII 300 event attracted a field of 1,520 entries. With a buy-in of $330, the tournament generated a prize pool of $433,200. Topping the pack was a very familiar face to the Parx Casino poker room, as ambassador Matt Glantz took the title and earned a $55,357 payday. Although he won the event as a representative of the room, amid his run to the winner's circle Glantz released news that he would be leaving his position as Parx Casino and Parx Poker Room ambassador come November. "It is with mixed emotions I announce that as of November I will be leaving my position with Parx Casino and the Parx Poker Room," Glantz posted on Twitter on Friday. "The last three years representing Parx have been very rewarding for me. Over the last few years we have transformed our poker room from a regionally recognized poker room to a national brand that rivals the largest of poker rooms on the East Coast." In the Big Stax XIII 300 event, Glantz reached the final table second in chips behind Moe Farah. The two were joined by Jose Jaramillo, Ramon Liriano Jr., Tyler Bowker, Esther Taylor-Brady, Anne-Marie Caparros, John Averill, Andrew Weinstein, and Kori Hunter. Jaramillo was the first to fall in 10th place, and then Weinstein hit the rail in ninth. Bowker was eliminated in eighth place before the remaining seven competitors moved into the five-figure payout slots. In seventh finished Hunter, and then Farah saw his run end in sixth place. Along with Glantz, Taylor-Brady was the other room ambassador at the final table, and her run finished with a $18,628 payout in fifth place. According to reports from the event, Taylor-Brady was all in from the hijack seat for 3.05 million with the blinds at 150,000/300,000/50,000 during Level 33. Averill called on the button, and everyone else folded to see Taylor-Brady at risk with the to Averill's . After a clean flop for Taylor-Brady, an ace on the turn and a king on the river delivered two pair to Averill and he won the pot. Caparros then fell in fourth place before the final three players — Glantz, Averill, and Liriano Jr. — opted to strike a deal. Liriano Jr. and Averill took $50,000 each, and Glantz received $55,357 plus the official title. As part of the deal, Glantz agreed to leave $5,000 for the Parx Poker Room dealers as a "going away present." With the score, Glantz moved over $6 million in career live tournament earnings, joining a group of just 95 other poker players to reach that achievement. The Parx Casino Big Stax XIII will continue through Monday, Oct. 19. Thursday, Oct. 8, marks the start of the festival's $550 Big Stax 500 event, and then the $1,200 Big Stax 1100 kicks off Friday, Oct. 16. For more information on the series, click here. **Image and data courtesy of the Parx Poker Blog. Exclusive $2,000 FantasyWired/PokerNews NFL Freeroll at DraftKings!